For optimal tinting strength and coverage in an undiluted acrylic paint, Golden's Matte Fluid Acrylics are an excellent choice. 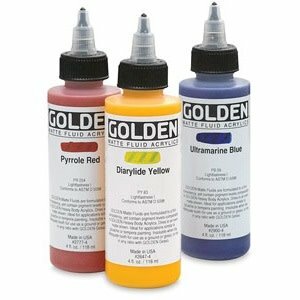 First created on a custom basis for artists requesting a pigment-saturated, low-viscosity acrylic paint, Golden Matte Fluid Acrylics require no thinning with water or mediums to achieve a wide variety of effects. Ideal for pouring, puddling, and dripping, Matte Fluid Acrylics can also be used as an alternative to watercolors for staining, and for spray application.